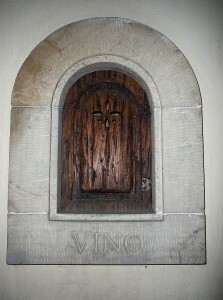 The wine portals, buchette del vino, are unique to Florentine architecture. 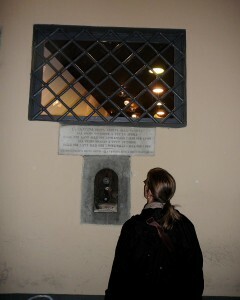 An observant visitor on a walk through Florence can find dozens of these small, once useful, doors. Those who have traveled to Rome, Venice, Milan, or even the small hill towns of Tuscany know that Florentine palaces built during the Renaissance were designed to resemble the bank vaults of their owners. (The city was once the home to over one hundred banking families, serving all of Europe.) The palaces had few windows in the exterior walls and the central courtyards were closed behind massive fortified doors to all but invited guests. Florentine bankers were diversified in their holdings and their entrepreneurial interests. Some foreign monarch might not be trusted to repay in cash the loan made by the Medici or Strozzi bank to fund his next war. But a savvy Florentine banker could probably talk the king into shipping wool from his thousands of sheep to Florence, where the banker’s brother would see it spun and dyed and sold as fine Italian woolen cloth. The same banker would surely have acquired (through purchase, papal grant, or military action) property in the Tuscan countryside where a cousin would be charged with shipping olives and olive oil, grains and flour, vegetables and prociutto, and grapes and wine to the family palazzo in Florence. These would be stored in the cantina, at or below street level, near the front door of the building. Now, the banker had a problem: how to keep the riff-raff out of his palazzo, but still make money by selling the bounty of the family’s country estates. The buchette del vino (literally, “the wine holes”) solved the problem. Through the thick wall of the palace, at the location of the cantina, a small opening, the size of a fiasco of wine, was created. It was closed with a wooden door. The cantiniere, or storeroom manager, would respond to a knock on the door. Depending on the request, he would dispense wine into the customer’s cup or bottle or pass through a straw-covered liter (fiasco) of wine from the cantina’s stock that just fit through the opening. The cantiniere would also take orders for large glass demijohns (damigiana) or wooden barrels of wine, both of which would be delivered to the customer at the service entrance of the palazzo. Although the small portals became known as buchette del vino, other products were sold through them by the same order and delivery mode – flasks of olive oil, cured legs of pork, bags of flour, and baskets of vegetables. The best example of a wine portal is the buchetta of Palazzo Viviani, which was still in use in the 1700s. 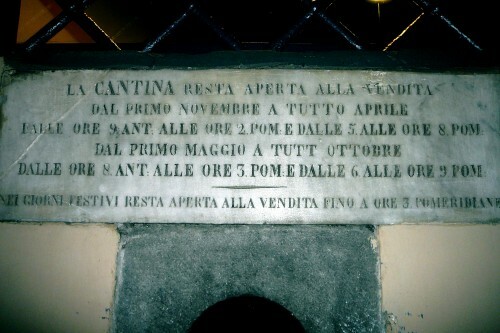 A marble plaque above it states the hours that the cantina was open – not only for each day, but also varying by season and for holidays. 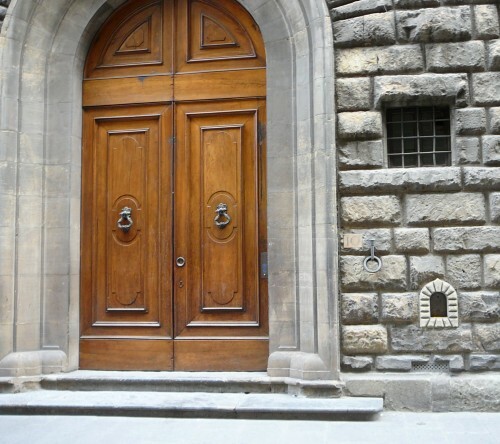 A well-known portal (see photo above) on the north side of Palazzo Antinori (home of famed vintners for the past 500 years) and next to the entry door of Ristorante Buca Lapi, is a fake. Although celebrated at the beginning of an excellent CBS 60 Minutes piece, the impressively “aged” wooden door goes nowhere, and never did. The wine portal in the Palazzo Strozzino (the “starter” home of the Strozzi before they built the “keeping up with the Medici” palace across the square) is a bit odd because it is uncomfortably low and incorporates a superfluous base stone. Some propose that the stone was part of the foundation of a previous medieval building and Michelozzo, the architect, incorporated it into his final design. Like the Strozzi, the Pazzi were competing bankers of the Medici. They built their own grand palazzo in 1468 on Via del Proconsolo with a wine portal at the appropriate height next to the grand entry door. Due to their failed attempt to murder Lorenzo de’ Medici in 1478, Pazzi wine was sold through the buchetta del vino for only ten years. Lorenzo the Magnificent ousted the family from the palazzo and banished the Pazzi from Florence. 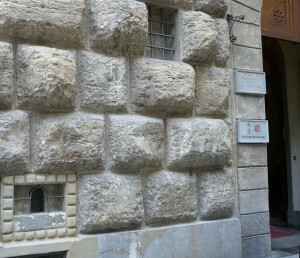 Today, the buchette del vino are preserved by law as historical architectural artifacts. This has not stopped them from being turned into mail slots, doorbell/intercom posts, or plastered walls with a vague outline of an more interesting past. See Mangia! Mangia! 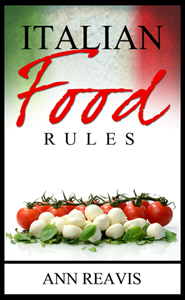 – Tale of Two Brothers – a previous post – and find the wine portal in the photo of Trattoria Il Latini. Was looking for wooden doors and found your post. Nice wine portals, my favorite wine is the Shiraz. Every time I think this site can’t get any better, it does. It’s truly remarkable how you keep taking it to the next level. Kudos to you! I’ve loved reading this, there is so much interesting information here. I am actually writing an essay for my University module on these Buchette del vino and I just wondered if I could ask, where did you get your information from? I am definitely crediting your site for any information that I have used, but I would like to back it up with more sources, maybe books or articles that you have read in order to find your information. I have information on the wine doors if you still need.